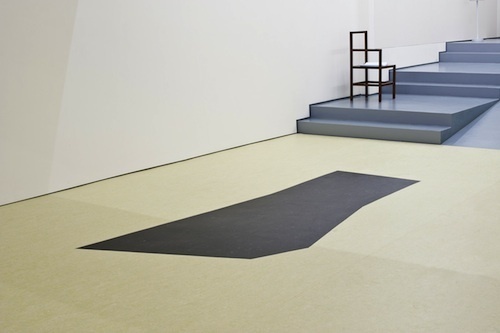 Becky Beasley, Given (or One to One), 2012, linoleum, dimensions variable. Questions related to the overlapping histories of the photographic and the sculptural, to thresholds between the two, and to conditions for exhibiting both have been at the core of Becky Beasley’s work for over ten years. Her current exhibition in Lisbon makes evident her primary conceptual concerns. Take the newest piece, specially commissioned for this show: Given (or One to One), 2012. Installed near the entrance to the show, this floor-based work consists of a large piece of linoleum on which a black abstract form has been printed. The work is simultaneously an image (the abstract shape is based on the exact measurements of the interior of Étant donnés taken from a 1:10 scale paper model that Marcel Duchamp made as part of his manual of instructions for the original work after it was finished) and also a very sculptural piece, walking a fine line between photography and sculpture. The same argument could be applied to the earliest work on view: Modern Times, 2004–2005, for which Beasley collected objects found in the streets of Athens and then covered and photographed them in her studio. Each sculptural mass is thus flattened as a photographic image. As is common in her practice, there are many layers for the viewer to unpack here, and queries circulate from one piece to another, yet without a desire for a coherent exhibition narrative. This elusive quality is also evoked by the title of the show, “The Man Nobody Could Lift,” which is the title of a novel by Bernard Malamud. Although almost always inspired by literature, Beasley’s works defy simple descriptions. They are abstract and tacit and usually suggest hidden mysteries. This exhibition nicely encapsulates Beasley’s resistance to classification, to description, and to conventional perspectives, as well as her penchant for ambiguity.